NAPA, CA, AUGUST 4, 2012 — The V Foundation for Cancer Research’s annual fundraiser, The V Wine Celebration, garnered nearly $4 million over the weekend of August 3 and 4 for cancer research. The V Foundation’s signature fundraising event attracted attendees from all over the U.S. to the Napa Valley for a gala weekend of events and activities with a serious underlying purpose — to benefit the foundation’s efforts to support significant cancer research at major institutions and research centers nationwide. The 14th annual V Wine Celebration kicked off Friday evening with its popular “Let’s Get it Started” party at The Pavilion at The Vintage Estates in Yountville. Food prepared by some of Napa Valley’s renowned restaurateurs and chefs was accompanied by an array of wines from equally legendary Napa Valley wineries. Guests bid on silent, super silent, and barrel auction lots comprising unique wine, sports, art and travel packages, and danced to high-energy music performed by David Martin’s House Party. Saturday morning the foundation presented a public Cancer Research Symposium, where prominent physicians and research scientists from around the nation gathered to present the most current advances and discoveries in clinical applications, new diagnostics and alternative treatments for cancer. The standing-room-only crowd of several hundred then had the rare opportunity of posing questions to these leading researchers during a lively Q&A session. The weekend’s activities culminated with a gala dinner and live auction at Nickel & Nickel Winery. Suzanne Pride Bryan of Pride Mountain Vineyards was honored as the V Vintner grant recipient. A breast cancer survivor herself, Suzanne shared the story of her father Jim Pride’s battle with bladder cancer. Before he died, he made a generous gift to Stanford to advance the fight against bladder cancer — which helped the research team to isolate the stem cell for bladder cancer, a critical step toward identifying a cure. The V Foundation will make a donation in Suzanne’s name to the Masonic Cancer Center at University of Minnesota to research enzyme catalyst mutations in breast cancer. The most compelling component of the auction was this year’s Fund-A-Need, auction lot #11, which honored the first responders to 9/11. V Foundation CEO Nick Valvano introduced the Fund-A-Need and acknowledged the dozens of men and women in uniform surrounding the room, Napa County’s first responders, who received a standing ovation from the appreciative crowd. Researchers have reported the presence of hundreds of compounds in Ground Zero dust, among them known carcinogens. Many of the first responders, who arrived at the site of the World Trade Center within hours of the twin towers’ collapse and spent months searching for survivors and cleaning up after the attacks, are now being diagnosed with cancer. After a video showing images from that fateful day accompanied by a stirring rendition of God Bless America sung by the “singing policeman,” New York City cop Daniel Rodriguez, bidders honored these heroes by uniting to donate more than $800,000 to support a collaborative effort between the Fire Department of the City of New York WTC Health Program, Montefiore Medical Center, the Albert Einstein College of Medicine, and the National Cancer Institute. Michael and Carole Marks, followed by Tracy and Lou Ann ORourke, generously kicked off the fund-a-need, pledging $100,000 each. Auctioneer David Reynolds kept the bidding lively through all 34 lots, including travel experiences in China, Turkey and Finland, a walk-on role on the popular TV show Royal Pains, and a never-before-offered vertical featuring 19 Vintages of Harlan Estate wines. Befitting the foundation’s origins (it was founded in 1993 by ESPN and the late Jim Valvano, legendary North Carolina State basketball coach and ESPN commentator), sports enthusiasts found a variety of enticing lots, among them the opportunity to sail on USA 76, Oracle’s AC Class boat that competed in the America’s Cup and VIP tickets to the winter and summer X Games, Indy 500, the Masters, the ESPYs, the Super Bowl and the Duke Blue Devils Bonanza. The live auction also featured lots donated by Bentley Motors, Inc. of an ice driving experience in Finland, including accommodations at a luxury chalet, round-trip business class air travel, a dog sled tour and snowmobile excursion; as well as a special Napa Valley package for 10 couples including dinner at the exclusive Napa Valley Reserve and overnight accommodations at Meadowood Resort. Last year, Larry and Nancy Probst were the lucky winners of a 2012 Bentley Continental GT Coupe. This year, the Probsts generously donated that car back to The V Wine Celebration to be raffled off again. Generosity paid off for top bidders Launny and Weezie Steffens, proprietors of Vineyard 7 & 8, who were the proud winners of the Bentley in this year’s raffle. In addition to a generous pledge to the Fund-A-Need, the Steffens won lot #23, a private concert and dinner with Joshua Bell and Beth Nickel in New York, and lot #32, a Clubhouse Finish Line Suite on Millionaire’s Row at the Kentucky Derby. Both Donald and Irene Dizney and Linda and Gus Doppes captured VIP tickets to Good Morning America, when Robin Roberts, Good Morning America and ESPN host and V Foundation board member, generously agreed to double the lot. Rich and Leslie Frank are headed on a 10-day journey for six to Turkey and an eight-day tour of China after taking home lots #4 and #8. Ron and Teri Kuhn are staying closer to home, premier tickets to SuperBowl XVII, a grand celebration in honor of Robert Mondavi’s 100th birthday and VIP tickets to the 124th Rose Parade. Evan and Cindy Goldberg took home the rare 19-vintage Harlan Estate vertical and a luxury stay and golf excursion in Pebble Beach. After the final gavel, the entertainment continued with a private performance by American rock legend Chris Isaak, followed by a meet-and-greet. Guests at The V Wine Celebration were chauffeured to events in luxury automobiles provided by Audi, proud sponsor of The V Wine Celebration. 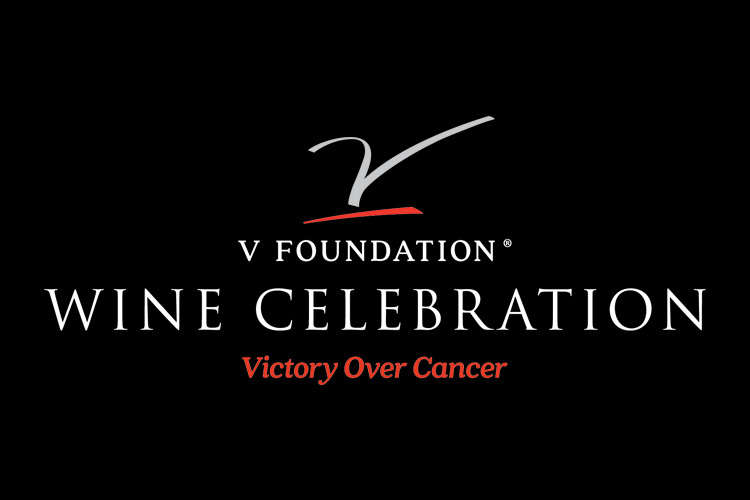 The 15th anniversary of the V Foundation Wine Celebration will be held August 2 and 3, 2013. For more information about the 2013 event, call 707-963-0611 or visit www.winecelebration.org. The V Foundation for Cancer Research was founded in 1993 by ESPN and the late Jim Valvano, legendary North Carolina State basketball coach and ESPN commentator. Since 1993, The Foundation has raised more than $120 million to fund cancer research grants nationwide. It awards 100 percent of all direct cash donations and net proceeds of events directly to cancer research and related programs. The V Foundation, which has received eight top four-star ratings from Charity Navigator, awards grants through a competitive awards process strictly supervised by a scientific advisory board. For more information on The V Foundation or to make a donation, please visit www.jimmyv.org or www.winecelebration.org.